Stoudsmoor Country Inn wedding at Stroudsburg Pennsylvania. 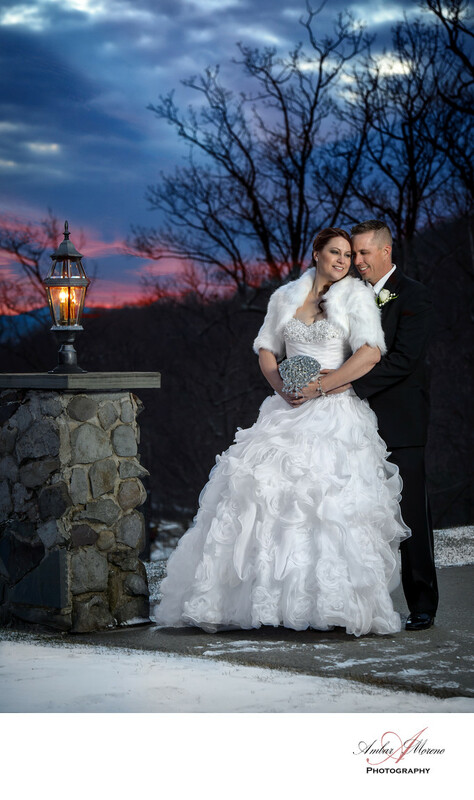 A beautiful Pocono Mountains wedding. It was a bitterly cold winter evening when I photographed this amazing image of the couple who bravely stood outside in the cold weather. The wedding venue is a rustic and yet elegant venue. The scenery is spectacular and the beautiful mountains can be seen from the banquet room that has windows from one end of the room to the other. The brides gown was so beautiful and I enjoyed photographing her with the backdrop of the surrounding scenery. Stroudsmoor Inn is spacious and elegant wedding venue which provides a spectacular view and a rich and rustic architecture. I truly believe the beautiful setting is what sets this venue apart from others in the area. The photo opportunities by far were many and impressive. Location: 231 Stroudsmoor Rd, Stroudsburg, PA.
Keywords: Stroudsburg (9), Stroudsmoor Country Inn (9).